With tough armor and rugged endurance, tanks take a battering but power through to protect. 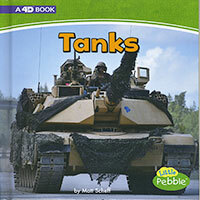 Take to the sand to learn all about the military's fierce squadron of tough tanks. Little Pebble books have an ATOS level of 1.0 or below. Bring augmented reality to your students by downloading the free Capstone 4D app and scanning for access to an online article, video, and discussion questions.